Here’s a great gift for Father’s Day that any dad with a truck should appreciate. Forum member John Niemi crafts custom hitch covers that look like the end of a cartridge case, complete with head-stamp. 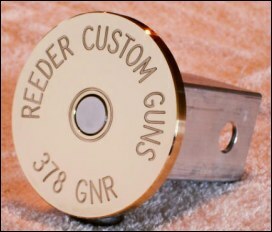 Costing $70.50 (delivered), they are made out of solid brass with a stainless steel “primer”. The diameter of the brass is 4 inches and the engraved letters are about half an inch tall. The section that slides over the trailer hitch is aluminum, so you don’t have to worry about rust. 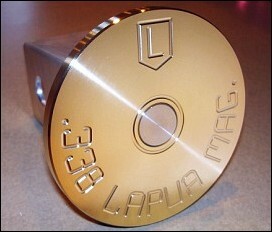 The current price for brass bullet hitch covers from John Niemi is $75.00 shipped anywhere in the USA. To order, send email to JohnNiemi [at] charter.net or call (503) 440-1954. Share the post "Great Father’s Day Gift: Custom Hitch Covers by John Niemi"
Every year Cabela’s runs a big Father’s Day Sale with some awesome web specials on Cabelas.com. Plus there are in-store-only sales at most Cabela’s retail outlets around the country. CLICK HERE for a list of stores, then click “Store Info” for the store nearest you. That will take you to a page where you can view the Father’s Day flyer for that store. Share the post "Major Father’s Day Sale at Cabela’s"